In February of 2012, I purchased this mysterious squirrel from the Purple Toybox in the UK off of eBay for 10GBP. She is 6 inches tall, wears a dress, but has no tail. Her face shape is just like that of a Furbank squirrel but a bit larger. The plastic she is made of is thinner and harder than a regular figure but the flocking is similar. Her arms, legs and head move. Her eyes are more like a flat disk button than the rounded eyes of regular figures. She has flat hands like vintage Tomy figures. Does anyone know where she is from? Perhaps she was part of a display or special giveaway. Whoever she is, she’s a nice addition to my collection and I will probably make her a tail! I know what this is! This is from another company and they are marketed under the name “Play at Home”. 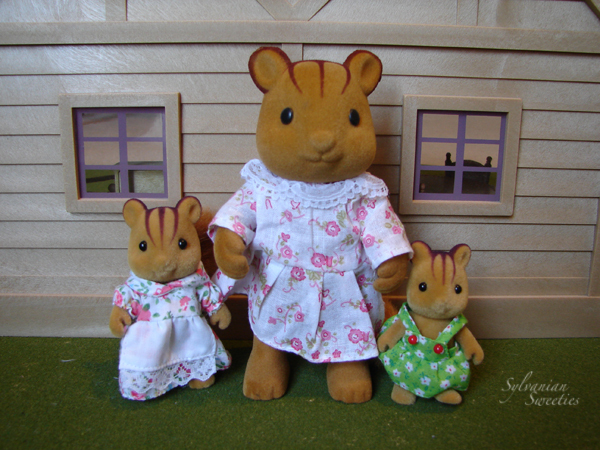 They are technically knockoffs of Sylvanians, but much bigger. Thanks Santie! I actually have a message in that thread! Even though she is a large knockoff, I think she looks the most like a real Sylvanian figure of the other ones Play At Home created.